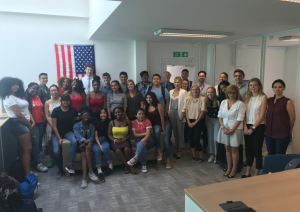 On Wednesday, 25 July, BritishAmerican Business (BAB) was delighted to be joined at our London offices by a group of 20 high school students on a cultural exchange from the United States. The students attended schools in a range of different cities and states – New York/Connecticut, Washington, Charlotte, Houston , Orange County and Baltimore, and were led on the trip by Craig Worthington, Academic Dean & IB Coordinator at ACS Cobham international School. This exchange was organised by ACS Schools, with support from the BAB Foundation, and select chapters of the British-American Business Council (BABC). The purpose of the students’ visit to the UK was both a cultural and educational one. Meeting with members of BAB’s Policy & Trade team including Emanuel Adam, Director of Policy & Trade, and Theo Bachrach, Policy and Public Affairs Manager, the students discussed the current landscape in British politics, including the recent changes in Theresa May’s Cabinet, transatlantic trade, and of course Brexit. What stood out amongst this group of students was their enthusiasm, and genuine interest in the political and economic affairs of the UK. The questions posed to the BAB team showed a demonstrated understanding of many of the intricacies of the UK political system, and a clear desire to know more. “The students were a joy to meet and spend time with. They give us great reasons to be optimistic about the future. Young people should never be overlooked when it comes to policy, as they always come with smart ideas, energy and perspectives that enrich policy discussions”. BritishAmerican Business would like to thank both the ACS for organising this fantastic exchange, as well as the students themselves for making this as much a learning experience for us as it was for them. We would also like to thank the chapters of the BABC who assisted in the funding and organisation of this trip. To find out more about ACS Schools, please click here.